Our brand-new Outlandish Color Series in Lhasa Wilderness and Himalayan Trail will be making its fiber show debut! We've even redesigned our booth to let these gorgeous hand-dyed colorways take center stage, and if you can't join us at the show, we'll be sure to share some photos on our Facebook page and Instagram feed! New Colors! 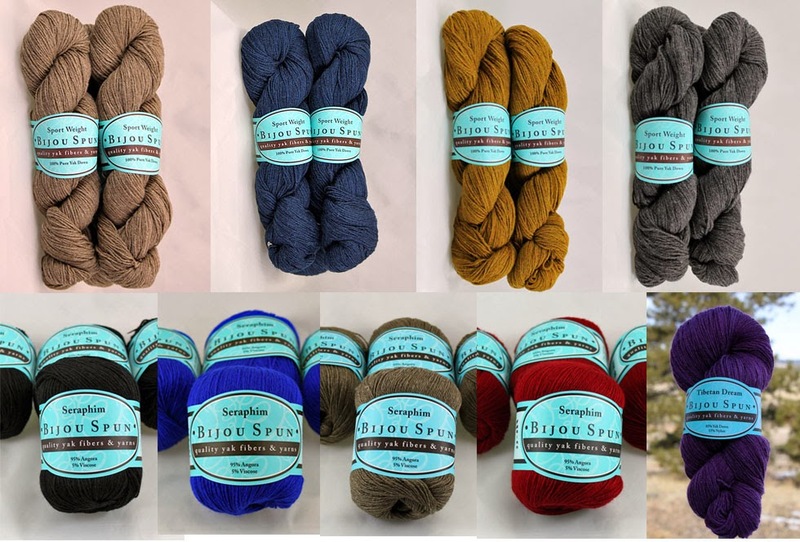 We have 4 new colors of our 100% Yak Sport Weight: Light Brown, Navy Blue, Gold and Charcoal; 4 new colors of Seraphim, our angora blend laceweight yarn: Black, Blue, Brown and Red; and a new hand-dyed color of Tibetan Dream, Regal! By popular Request: Show favorite Shangri-La will be available in plentiful supply! We have stocked up on all of our colors, including Amethyst. Book Signings! Stephannie Tallent (Hitch, Patterns inspired by the Films of Alfred Hitchcock), Erica Hernandez (What Else Would Madame DeFarge Knit?) and Faina Goberstein (The Art of Seamless Knitting) will be joining us in our booth throughout the weekend, so be sure to stop by to see who's on hand to meet & greet AND sign books! Save big on your show purchase with this valuable coupon - simply print and redeem in our booth or show it to us on your smartphone (we even have a free app)! 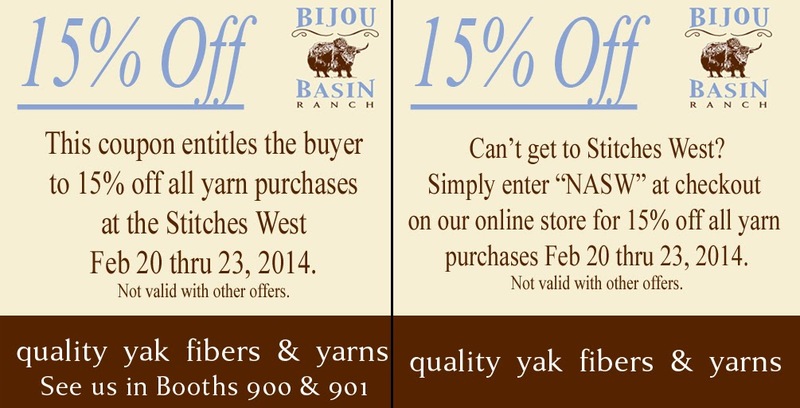 We look forward to seeing everyone at Stitches West this weekend. If you can't make it, be sure to connect with us online - and don't forget, ALL of our new colors are available in our online store. We even have a special deal for you while we're away at the show! BBR Euro Stickers are back! We'd like to see all of the interesting places our stickers end up, so we've devised this little game: Take the sticker and put it someplace cool (permanently or not), take a picture and post it on our Facebook page. Don't forget to like us if you haven't already! If we choose your photo to use as our cover image for a few days, you'll not only get your 15 minutes of Facebook fame, we'll also send you a coupon for 10% off in our online store. Plus, EVERYONE who posts a photo will get a coupon for FREE shipping on their next online order - just leave us your Ravelry ID or email address in the photo descriptions so we can send it your way! Stickers are free with purchase at shows and ship free with each online purchase (or you may purchase 3 for $5 with FREE shipping via this link). Have fun!